Our focus on patient health and comfort starts with a compassionate, caring staff. Take a minute to meet all the folks behind the smiles at Signature Dentistry of Macon. The infectious laughter you hear in the halls of Signature Dentistry belongs to Donna Sammons. 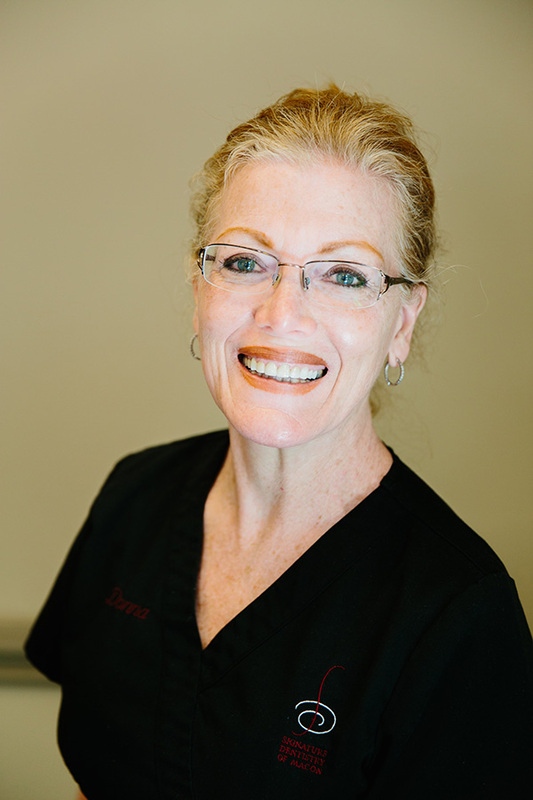 Donna has been with Dr. Lawson since she started her practice and recently celebrated her 10 year Anniversary with the practice in 2017. 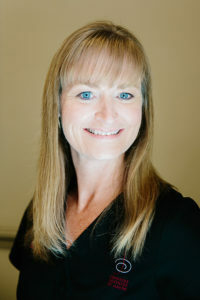 After graduating from Northside High School in Warner Robins, Georgia, Donna went on to receive her degree in dental hygiene in 1983 and a degree as a registered nurse from Macon State College in 1993. Donna took to dental hygiene for the one-on-one relationships she could develop with patients. She takes great satisfaction at their improved and continued good dental health. She finds it very satisfying to work in an environment where patient care is priority number one. Donna, along with her husband John, son Max, daughter-in-law Ashleigh, and granddaughter Leighton Kelly are true animal lovers and have four dogs of their own. They enjoy traveling, exploring Georgia State Parks, biking, kayaking and of course, spending time with their furry babies, but above all else, Donna loves her grandbaby! Dental cleanings and patient education are two top priorities for Charlotte Robinson. 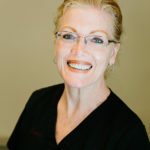 The Newnan, Georgia native brings nearly 30 years of experience in dental hygiene to her patients at Signature Dentistry, and they are thrilled to have her! Charlotte’s older sister was a hygienist who inspired Charlotte to enter this rewarding field. A graduate of Newnan High School, Charlotte went on to study at West Georgia College and then to Macon State College where she received her degree in dental hygiene. 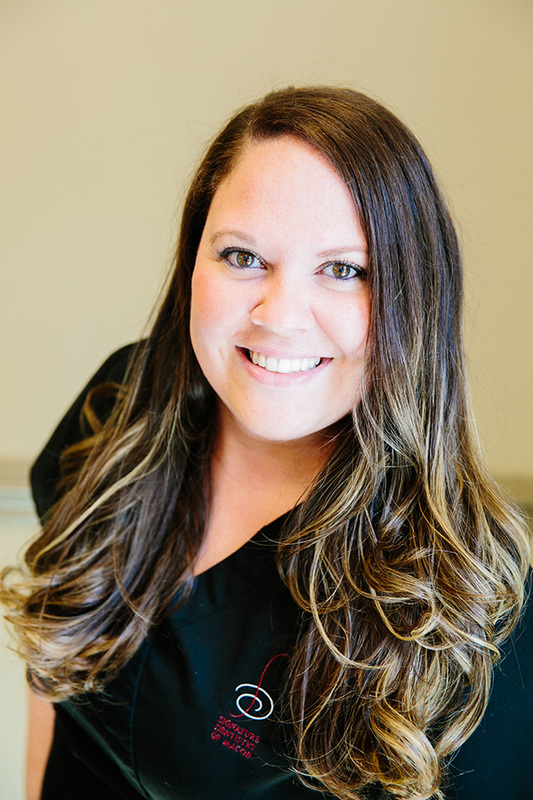 Charlotte joined the Signature Dentistry of Macon team in 2013, and found a home where patient care is number one. She enjoys seeing her patients and their smiling faces, and is thankful her efforts on their behalf are appreciated. Charlotte, along with her husband, Bryon, son Kody and daughter Jessica, love to watch movies and spend quality time together. They are active members at Northway Church, where she and her husband work with the children’s ministry. 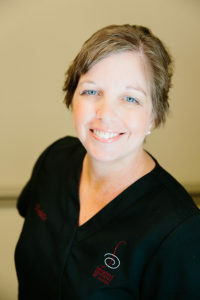 A sweet and welcoming face you will see at Signature Dentistry of Macon assisting Dr. Lawson is Tanya Lauber. Tanya is Dr. Lawson’s Lead Assistant and helps with assisting with all dental procedures, ordering dental supplies, and taking excellent care of patients. Tanya grew up in Forsyth, Georgia, and graduated from Mary Persons High School in 1991. She began her career in the dental field in 1998 and, with no prior assisting experience, was offered a position as a dental assistant. She quickly learned the trade and fell in love with it! 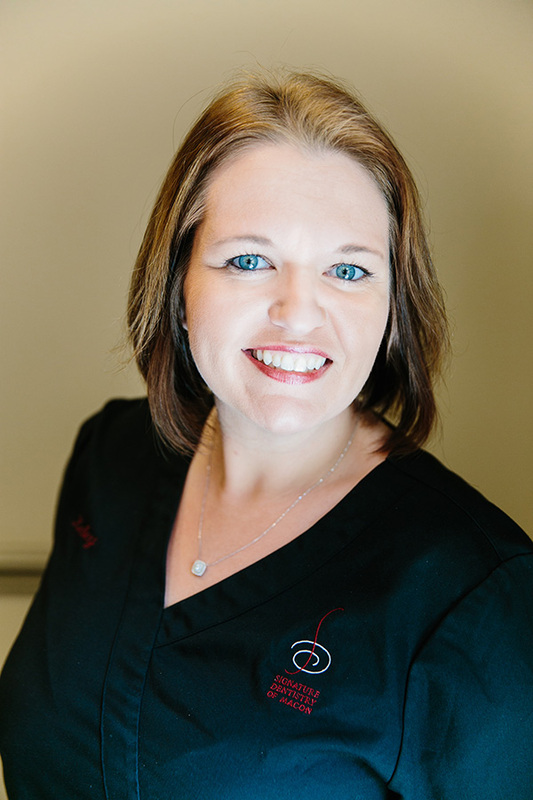 Known for her calm and soft demeanor, Tanya is able put patients at ease when receiving dental treatment at Signature Dentistry. Tanya has a wonderful husband and together they have 2 beautiful children. You’ll find Tanya either swimming, shopping, canoeing, or hanging out with her family in her spare time. 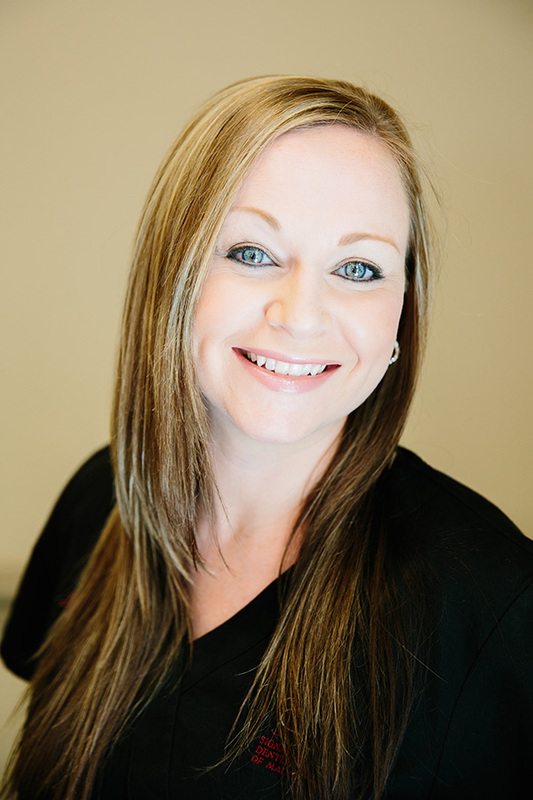 One of the friendly faces you will see assisting Dr. Lawson with dental procedures, sanitizing instruments, and educating patients on treatment is Kelley Wright. Kelley was drawn to Dr. Lawson because of her caring nature for both patients and staff. Kelley considers her co-workers at Signature Dentistry like a second family and has been with the practice since 2015. Kelley grew up in Sacramento, Ca. where both her parents were active in the military at McClellan Air Force Base. In 1998, Kelley pursued the Dental Assisting program at McClellan AFB to achieve her Assisting certification. When Kelley was 25, she and her family moved to Warner Robins and have remained in the area ever since. She has two smart and talented boys, Brayden and Kaleb and during her spare time, she and her family enjoy baking, reading, traveling, and serving the local community. Greeting you once you enter Signature Dentistry of Macon is Hannah Jones. She provides patients with the utmost customer service from the time they enter the practice until they leave. From scheduling patients for appointments to reviewing treatment plans, Hannah’s down-to-earth style makes patients feel comfortable and confident with the care they receive in a way that is easily noticeable. From Luella High School in Locust Grove, GA, Hannah received her diploma in Dental Assisting at Southern Crescent Technical College and certifications in Expanded Functions and Radiology. Hannah has been with Signature Dentistry since 2012 and showcased her skills in multiple roles throughout the practice. From assisting Dr. Lawson in an operatory and hospital setting, to previously leading the office in a managerial role, she now facilitates patient scheduling to expand their knowledge on recommended treatment and dental care plans. She has done it all! Hannah considers Dr. Lawson’s genuine care for patients and staff the right touch to what makes this office a pleasure to work in. She enjoys spending time with friends and family, especially school functions and events with her daughter, Kailan, and son, Kameron. Jesse has always been interested in the dental field and enjoys helping patients understand how their insurance benefits can help them achieve the smile they deserve! As she manages insurance claims and educates patients on their dental health benefits, she is passionate about guiding patients on financial matters to meet their dental needs. Jesse attended Southern Crescent Technical College in Griffin, Georgia. She graduated with a diploma in Dental Assisting and certifications in Expanded Function and Radiology. When she’s not spending time with her children Daylin, Jayvin, Lexi, and Madden, or shopping with friends, you can find Jesse decorating, painting, or restoring furniture. Jesse joined the Signature Dentistry team in 2015 and says she enjoys working for a practice that values patient care, encourages a friendly atmosphere, and always strives to help patients reach their goals. Jay Willis is the Office Manager and the newest member of Signature Dentistry of Macon. Prior to joining the team in November, 2018, the Indiana native finished a 29-year career in the United States Air Force and 6 years in the Retail Grocery Industry. He holds a Bachelor of Science in Business Finance from the University of Phoenix and, along with the challenge this new position holds, loves the family oriented environment at Signature Dentistry of Macon. Jay’s hobbies include reading, golf, music, and traveling. When he and his wife Allison aren’t traveling, they reside in Juliette, Georgia, with their two Jack Russell terriers, Scout and Wick.